From towering wild adventure to the depths of hellish horror! The police are after jim (Don Durant) for Gun Smuggling and for killing a man. He asks his brother Chris (Bill Cord) to sail him to safty, but are hit by a hurricane coming out of the China Sea and are stranded on an island of beautiful women. The Woman in charge tells them that a supply ship will come in 10 days. 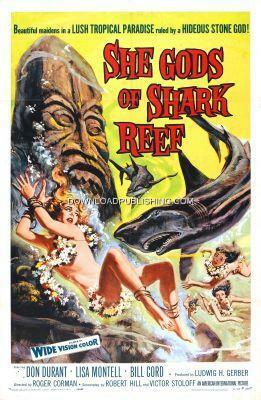 The Women are Pearl Divers and have to apease the island god by sacrificing young women by feeding them to the sharks.